Episodes of racial conflict in Detroit form just one facet of the city’s storied and legendary history, and they have sometimes overshadowed the less widely known but equally important occurrence of interracial cooperation in seeking solutions to the city’s problems. The conflicts also present many opportunities to analyze, learn from, and interrogate the past in order to help lay the groundwork for a stronger, more equitable future. This astute and prudent history poses a number of critical questions: Why and where have race riots occurred in Detroit? How has the racial climate changed or remained the same since the riots? What efforts have occurred since the riots to reduce racial inequality and conflicts, and to build bridges across racial divides? Unique among books on the subject, Detroit pays special attention to post-1967 social and political developments in the city, and expands upon the much-explored black-white dynamic to address the influx of more recent populations to Detroit: Middle Eastern Americans, Hispanic Americans, and Asian Americans. Crucially, the book explores the role of place of residence, spatial mobility, and spatial inequality as key factors in determining access to opportunities such as housing, education, employment, and other amenities, both in the suburbs and in the city. Joe T. Darden is Professor of Geography at Michigan State University and former Dean of Urban Affairs Programs from 1984 to 1997. He is also a former Fulbright Scholar. Dr. Darden's research interests are urban social geography, residential segregation, and socioeconomic neighborhood inequality in multi-racial societies. He has written numerous books on race and social issues. Richard W. Thomas is Professor Emeritus of History at Michigan State University. He has conducted workshops on race relations for over thirty years. Thomas is author and co-author of several books on race relations and the African-American experience including. 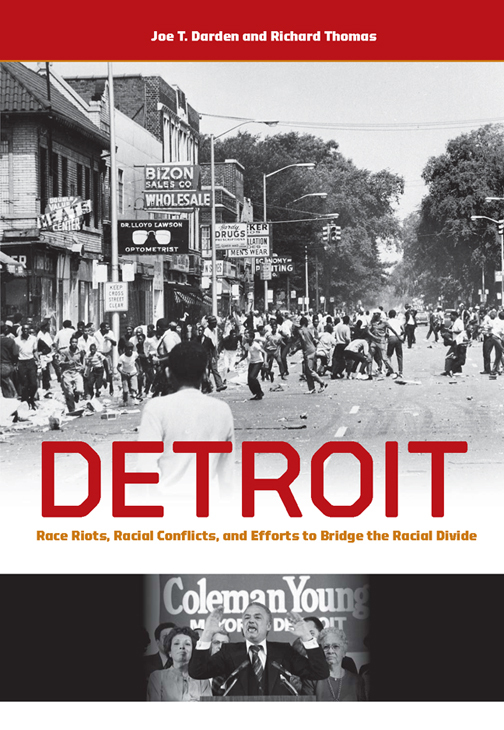 "This well-researched book gives the post-1967 racial and ethnic cauldron of Detroit its fullest expression as it explores points of conflict and cooperation in public policy and in daily life."